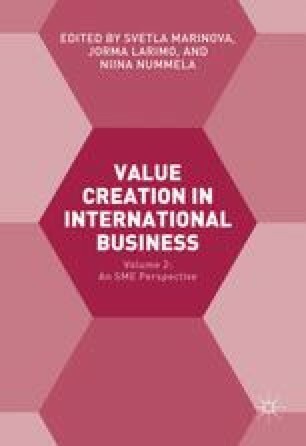 In international business (IB), value is generally considered as something that is created in a global value chain (Gereffi et al. 2005). Conventional views suggest that companies engage in exchange with other companies across different countries in a somewhat sequential manner (e.g. from raw materials, to production, to wholesalers, to retailers), and value is added along the way (Funk et al. 2010; Kumaraswamy et al. 2012). Nevertheless, there is not much discussion on how value is created or derived throughout these interactions. Instead, in line with neoclassical economics, it is generally assumed that value is created through firms’ participation in value chains and, ultimately, ‘consumed,’ or destroyed, by individual customers. This book chapter is part of the research programme REBUS, which is one of the research programmes of the Finnish Metals and Engineering Competence Cluster, FIMECC. REBUS is funded by the Finnish Funding Agency for Technology and Innovation (Tekes).